Contact (for families with disabled children) was founded by parents. Have a look at Who are we? Click page icon to find out about their helpline. There are four ways to get in touch with Contact: See Facebook, Twitter & email queries They seem to be good on nation-wide issues but not Grantham specifics. 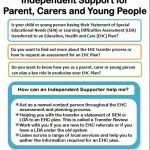 The first port of call for parents with concerns about their child’s Special Educational Needs (SEN) may be the school Special Educational Needs Co-ordinator or SENCo for short. The Educational Psychology Service has a telephone helpline for parents. It is advertised by Lincolnshire County Council and is available on a Tuesday from 1.30pm to 4.00pm. Phone 01522 554673 and ask for the helpline. See: How they work FAQ Example To help children prepare for a consultation, see pupil’s guide. See also Resources for Child and Adolescent Mental Health Services (CAMHS). Team around the child has put together a guide in the form of letters to parents and professionals to introduce key experiences faced by many families in this situation and to highlight their needs. Click icon to browse the guide intended to support families of children with complex needs and the professionals who care for them. See also background. 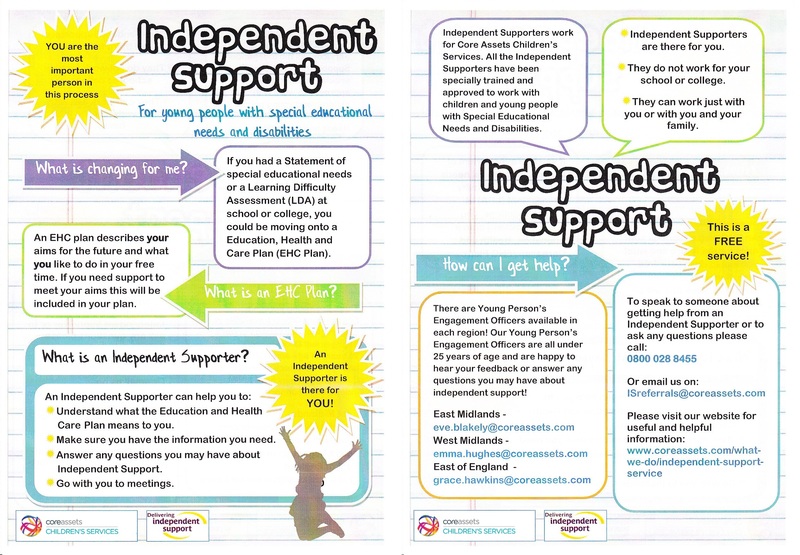 Independent Parental Special Education Advice (IPSEA). They offer legally based information and advice to help get the right education for your child or young person. Click icon for their website. Have a look at: Get support Our services Sarah’s story IPSEA was founded by SEN professionals – see history. Click icon to see the official Lincolnshire SEN support index. Liaise provide free and confidential information, advice and support to parents of children and young people with Special Educational Needs and Disability. This might be a good place to look next for parents with concerns about SEN.
See LIASE – with downloads in right margin, e.g. Support in mainstream school (click picture). They have Confidentiality and Impartiality policies. The information, advice and support should be impartial and provided at arm’s length from the local authority and Clinical Commissioning Groups. ACE Education Advice & Training provides independent advice and information for parents on education issues in England. See Advice for parents. Notice the large picture icons at the bottom of the page. It also outlines their confidential telephone advice line. See also call charges. This is provided by the Working Together Team in Lincolnshire. See: Introduction Detail. It encompasses Autism Outreach. Gosberton House School, near Spalding, provides the service, which is accredited by the National Autistic Society (NAS). The school specialises in autism It is a primary school and offers the service across Lincolnshire. It is for pupils in mainstream school. It is the school rather than the parent that needs to refer the pupil, though parents can seek advice about getting a referral. Click the National Autistic Society icon on the left to find out about extra help in school. If you cannot find what you are looking for try the phone icon on the right to find out about their Education rights service. Look for the How we can help link. You can phone or use email. 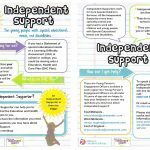 Core Assets Children’s Services offer free independent support with the new Education, Health and Care (EHC) plans – for children and young people with SEN. Parents and young people can apply directly for assistance, or simply make enquiries, via Referrals. Chose the large parent/carer button. See FAQ and website for more more information, e.g. 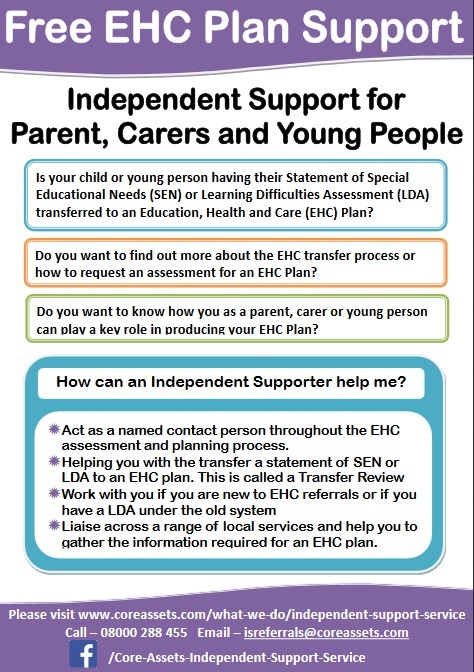 this support is available in Lincolnshire and Northamtonshire. We work in partnership with Liaise, but focus specifically on the EHC assessments and the transfers from statements to EHC’s, whereas Liaise support all SENd concerns.